A couple of years ago, the Philippines has adopted a more detailed and comprehensive way of measuring poverty. This methodology takes into the account the following dimensions: education, food and nutrition, health and santitation, and employment. Two indicators are used for education: school attendance and educational attainment. School attendance counts the number of families that have at least one school-age child (between age 5-17) that is not attending school, while educational attainment counts the number of families that have at least one family member aged 18 or older who have not completed high school. 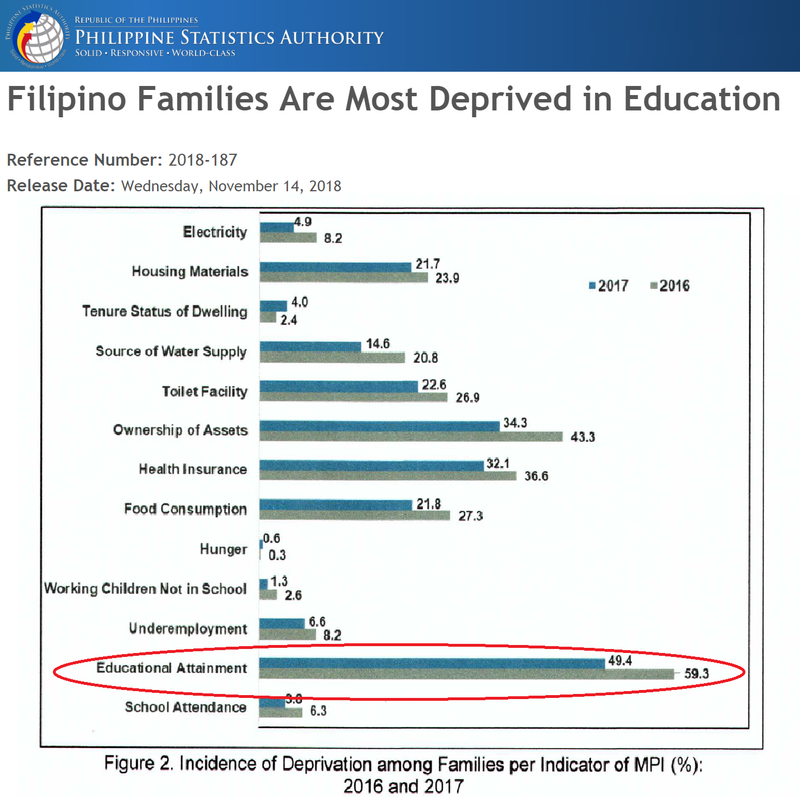 The initial numbers for the years 2016 and 2017 are indeed sobering for educational attainment: At least half of Filipino families have one member aged 18 or older that has not finished basic education. These numbers represent the first attempt to measure poverty in the Philippines along different dimensions. These are derived from representative surveys that include about 5000 families in 2016 and about 4000 families in 2017. The difference between two years for educational attainment, in my opinion, demonstrates the precision of these datasets, as it is not possible that the Philippines has reduced in a matter of only one year the number of families that has at least one member not finishing high school. 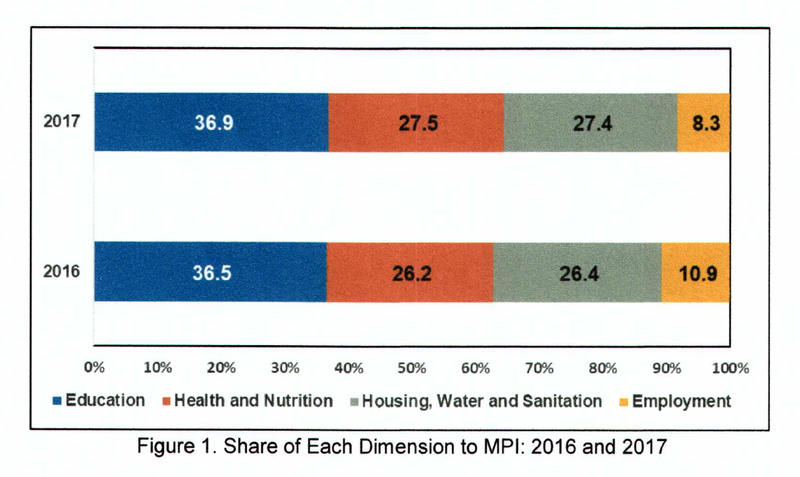 One can simply compare educational attainment against the other dimensions like access to a toilet facility and see that with dimensions that can be much more easily addressed than high school graduation, the reduction in the percentage of families deprived from 2016 to 2017 is not as great. Since the datasets are different, a year to year comparison does not appear to be accurate. 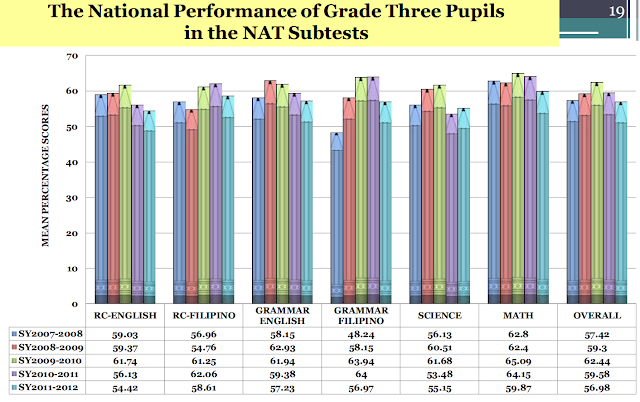 Nonetheless, the numbers for basic education still provide a glaring red flag for Philippine basic education. As noted, a better way to look at these numbers is to look at the data within the same year. 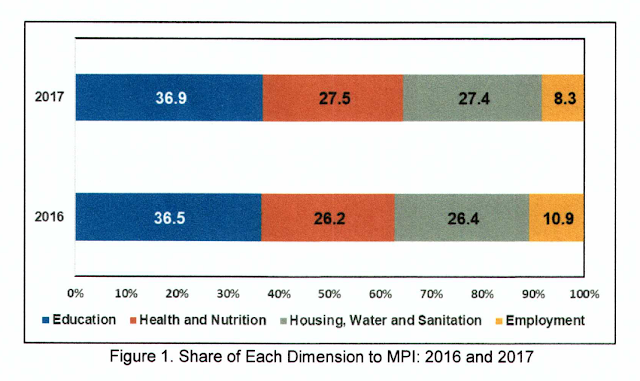 This multidimensional way of looking at poverty actually suggests that most Filipino families are poor because they have been deprived of, first and foremost, basic education. It is not food, not nutrition, not health care, not even employment, but education that tops the list. Here, a year to year comparison seems a lot more stable. And with this, the share of education to poverty is either constant or slightly increasing. A few days ago, the Supreme Court in the Philippines ruled unanimously in favor of the constitutionality of the Philippines' DepEd K to 12. The current secretary of education, Briones, celebrated the court's decision, "Successful naman ang start ng ating programa kasi last March and April nakapag-graduate tayo ng ating first batch ng senior high school graduates at this coming school year patuloy pa ang pag-eenrol sa senior high school program." 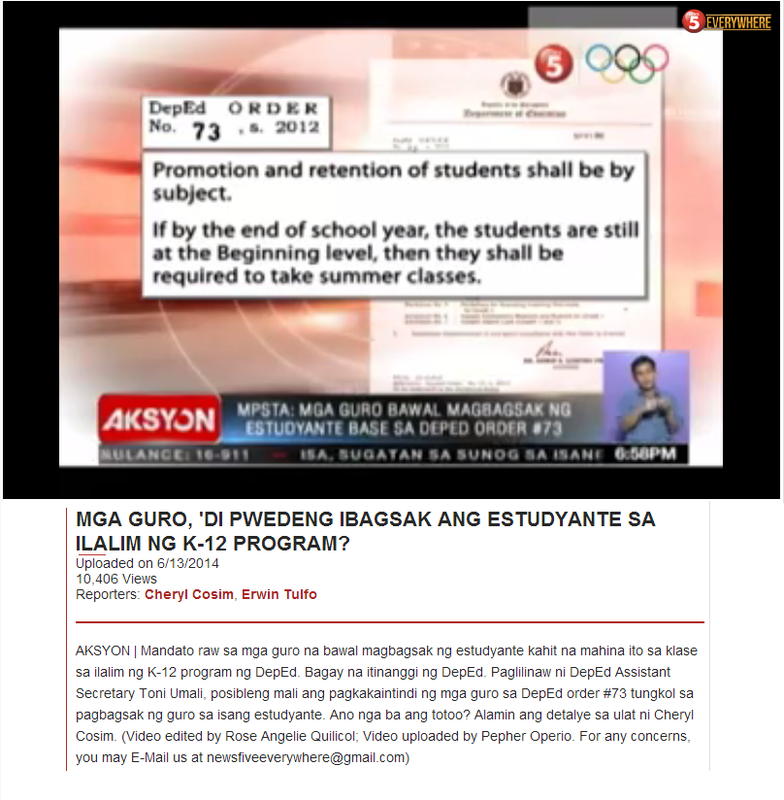 (The start of our program is successful and we are able to graduate the first batch of senior high school students and this coming school year, enrollment continues in the senior high school program) The court can always rule the constitutionality of a basic education program but whether a basic education system is working or not, that is solely decided by learning outcomes. Education should be the utmost priority of any government to produce better citizen: socially and economically. There are many public schools, both elementary and secondary, offer basic education in our country but there are still too many who did not finish it, as cited in this research. What else could our government do to address it?